Хеталия Hotel!. I would so live in the hotel if they worked there...-3-. 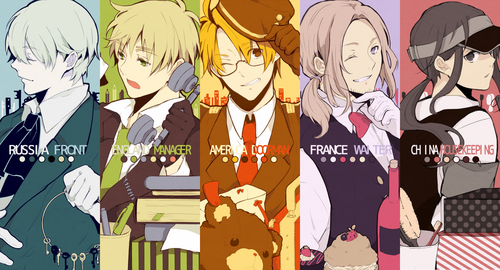 HD Wallpaper and background images in the Хеталия club tagged: hetalia aph america england france china russia allies. This Хеталия fan art might contain аниме, комиксы, манга, анимационные фильмы, комикс, мультфильм, and книга комиксов. Is there any Axis Hotel?? I wanna go to that hotel. And just hug the housekeeping at random moments. And the doorman... and the waiter. Russia is the Front?! I feel sorry for the one that get scared.